We use boat and plane surveys for estimates of population size, photographic identification of individuals, sound recordings and behavioural observations. Our research is non-invasive – we do not take any physical samples from living whales or dolphins. The NZ Whale and Dolphin Trust collaborates extensively with the Marine Mammal Research group of Otago University. 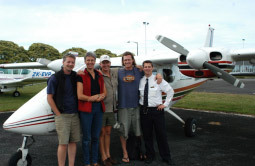 The Trust has funded and collaborated on several boat and plane surveys for Hector’s dolphins and right whales. We have developed and used acoustic methods extensively to survey sperm whales. These whales spend more than three quarters of their time underwater and so are very difficult to count visually. They make their characteristic clicking sounds, which are the loudest biological sounds known, most of the time while diving. We use these sounds to track the whales at depth and find out how deep they dive. Slooten, E., Dawson, S.M. and Rayment, W.J. 2004. Aerial surveys for coastal dolphins: Abundance of Hector’s dolphins off the South Island west coast, New Zealand. Marine Mammal Science 20: 117-130. Dawson, S.M., Slooten, E., DuFresne, S., Wade, P. and Clement, D. 2004. Small-boat surveys for coastal dolphins: Line-transect surveys for Hector’s dolphins (Cephalorhynchus hectori). Fishery Bulletin 201: 441-451. Slooten, E., Dawson, S.M., Rayment, W.J. and Childerhouse, S.J. 2006. A new abundance estimate for Maui’s dolphin: What does it mean for managing this critically endangered species? Biological Conservation 128: 576-581. The Trust’s work consistently focuses on aspects of whale and dolphin biology that are important for their conservation. A good example of this is our recent aerial surveys off Banks Peninsula. 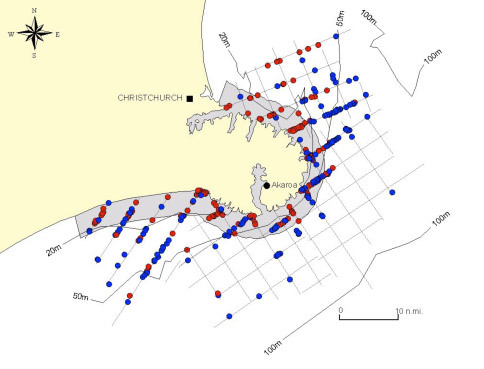 These were designed to assess how much protection the Banks Peninsula Hector’s dolphins get from the Banks Peninsula Marine Mammal Sanctuary. In other words, are its boundaries in the right place? We flew the same survey lines each summer and winter for three years, and showed that Hector’s dolphins range much further offshore than the boundary of the protected area at Banks Peninsula. The map below shows the 4 nautical mile protected area (where gillnets are banned) in grey. It’s clear that the dolphins range much further offshore, to about 20 nautical miles from shore and almost out to the 100m depth contour.